The question of what to do with this blog has come up before. A few months ago, an old friend and I were in the middle of our typical banter when the conversation turned to nameplate websites and privacy and Google. My friend is a private guy, and like me, he’s put careful effort into staying off the Google radar and is pleased by his success. Me, my view changed a few years back. And to spare you my attempt on a lecture about the evolution of human society in the next century, instead I’ll tell you about a Batman comic. In The Dark Knight Returns by Frank Miller, Batman is running across a wire between two buildings when he gets shot right in the bright yellow oval on his chest. And as he’s falling, his internal monologue explains it to us: "Why do you think I wear a target on my chest — Can’t armor my head"
Well, I’m no crime-fighting billionaire, but the logic applies here too. I can’t stop the companies and organizations that are all trying to reassemble my identity from the traces and receipts I leave out there in the world. So instead of letting them assemble all the weak relationships into a maybe-me, I’m creating strong defined relationships to a definitely-me. And with all the attention now drawn to definitely-me, well, if that means that my quiet secret alter-egos get lost in the noise, so be it. Not that I have any great, dark secrets. I have things I’d rather not talk about, like anybody, but all that happens if my "secrets" come out is that I have to wait patiently for you to stop laughing at me. It’s not a life-threatening consequence. So here I am, with a public, named blog, in the world for all to see. And this is where we come back to my friend who was very startled to find that I’d gone to the dark side and exposed the collection of various online efforts into this public persona. I understand part of his reluctance. It’s my identity, and exposing that identity to the world offers a target for scammers, spammers and their close cousins, targeted marketers. But what convinced me that I needed to put myself out there was the realization that by making all my work anonymous, it means that there’s no evidence that I’ve done anything. It means that when I wrote a traffic-attracting review of The Giver (by Lois Lowry) for an online magazine a few years ago, all the traffic that it drew did me no good. Same with the work I do on websites, or the work I do for clients. I don’t care about the credit. I know what I’ve done, and you know what I’ve done for you if you’ve had my help. But I do care that I have credibility that comes from having a trail, and not having a trail reduces my credibility. Just like my resume provides some weight for an employer, or my portfolio demonstrates some of my capability for a client, the collection of my online activities becomes a credential for the online me. I post, therefore I am. Here I am. I was expecting my friend’s surprise at my embracing the search engine. What I didn’t expect was that he’d be disappointed for me not mentioning this project. Except I haven’t gotten past the existential aspect of it so I’m still very much embarrassed by the "in progress"ness of this place. I have all these ideas for what I want to do with it. And no time left to pursue them. But for now I’ll keep posting what comes to mind. And if you’ve got a thought or suggestion for me, let me know, would you? Talking to you would be a lot easier than coming up with things to say on my own. Tagged with batman, blogging, identity, meh, metaphysics, privacy. 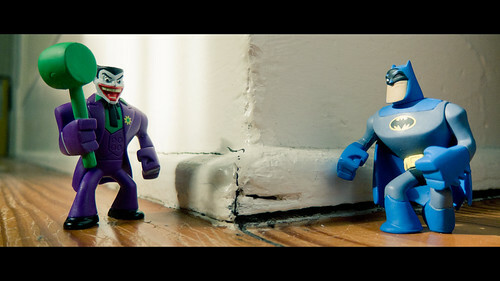 I just have to say that I really want those Batman action figures. I love this. I feel like I’m in the middle of a conversation with you that could go any of several directions.